The Oxyaenidae is a family of creodonts first described by renowned American paleontologist Edward Drinker Cope in 1877. While hyaenodonts are often described as dog- or hyena-like, oxyaenids are considered to be more cat-like or weasel-like in their general morphology with rather long bodies set on short, robust limbs. They were ambush predators with robust limbs, muscular bodies, shortened faces, and powerful jaws. They possessed enlarged, reinforced canines with blade-like molars, and some species even developed blunt premolars for cracking bones. The earliest known oxyaenid was a domestic cat-sized animal called Tytthaena parrisi, known from the middle Paleocene (Tiffanian) of what is now the state of Wyoming. Throughout the rest of the Paleocene and Eocene, a number of other oxyaenid species existed across the Northern Hemisphere ranging from fox-sized to bear-sized. From the middle Eocene onward, however, oxyaenids would face mounting competition from another group of cat-like predators known as the Nimravidae, close relatives of true cats (Felidae) in the modern order Carnivora*. By the late Eocene, oxyaenids are absent from most faunal assemblages while nimravids are relatively common. The last known member of this group, Sarkastodon mongoliensis, became extinct early in the Oligocene epoch. 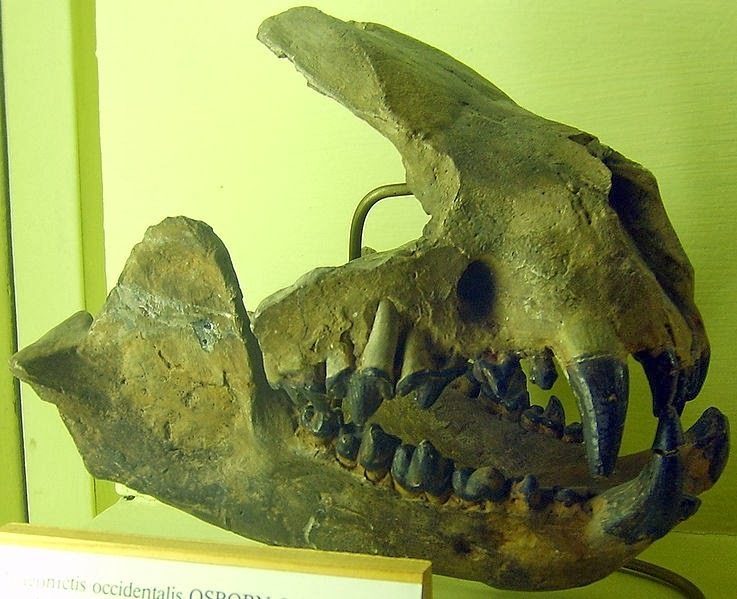 Unlike the hyaenodonts, oxyaenids were restricted to North America and Eurasia but never appear to have invaded Africa. When Dr. Jacob L. Wortman first examined the fossils Oxyaena and Patriofelis in the late 1800s, he concluded that the animals' spreading paws were evidence that they once supported a web-like structure like that found in many semi-aquatic animals such as otters. He remarked “the broad, flat, plantigrade feet with their spreading toes suggest at first glance their use for swimming”. This in mind, he also theorized that oxyaenids were the likely ancestors of today’s pinnipeds (seals, sea lions, and walruses). This proposal led artists to reconstruct Patriofelis as an otter-like animal with webbed toes as shown in this 1896 reconstruction by Charles R. Knight. They enable silent movement through the animal’s environment by muffling any sounds made as the animal walks. Though not suitable for sustained running, they are well suited for short bursts of speed necessary for an ambush predator, which is a more conservative hunting method. Their wide surface area enhances grip, enabling greater manual dexterity for climbing and seizing prey. A 1900 study comparing the feet of Oxyaena and Patriofelis to those of several modern opossums, raccoons, and cats revealed that the proportions of oxyaenid paws were comparable to those extant animals. The structure of the metapodials* also show that some oxyaenids may not have been fully plantigrade* as previously thought, but rather semi-digitigrade*. This would have enabled more efficient and agile movement on dry land. In life, oxyaenids would have possessed cushioning paw pads that would muffle their footsteps to further enable silent movement through their respective habitats. Oxyaenids were not the slow-moving, clumsy animals depicted in past writings and artwork. Rather, they were agile terrestrial predators adapted for long-distance walking, short bursts of speed, and perhaps some climbing ability. Oxyaenids are described as being cat-like, while hyaenodonts are said to be dog-like. Indeed, the skulls do exhibit some “cat-like” characteristics designed to kill prey with a single bite. As in felids, shortening of the rostrum is achieved by the loss of the first premolars and the last molars. This reduction helps direct more of the animals’ bite force to the canine teeth, which in oxyaenids were extremely robust with deep roots for durability. The molars are highly specialized for shearing with the primary cutting teeth (the carnassials) comprising the first upper and second lower molars. Interestingly, among oxyaenids there seems to be a trend toward the reduction of the incisors, possibly an adaptation to enhance the puncturing aspect of the dentition. Oxyaenid skulls are exceptionally broad, strong, and appear quite large compared to the rest of the skeleton. For example; the middle Eocene predator Patriofelis ferox was the size of a Jaguar in terms of its head-and-body length. However, it had a skull that was just as long and considerably wider than that of a Lion, an animal nearly twice its size. High sagittal crests*, flared zygomatic arches*, and huge depressions in the mandible were the attachment sites of powerful jaw muscles which resulted in a tremendous bite force. In these aspects, the skull morphology of oxyaenids is more analogous to the extinct marsupial lions (Thylacoleonidae) of Australia, which were themselves superficially cat-like animals with heavily-built skulls and teeth adapted for piercing. Partial dentary and skull of Palaeonictis occidentalis. Specimen on display at the Museum fur Naturkunde, Berlin. Members of the genera Machaeroides and Apataelurus are special in that they are the earliest known mammals to have developed saberteeth; specialized upper canines that have become elongated and laterally-flattened. As with nimravid and felid sabertooths, their skulls are designed to increase their maximum gape and employ a downward stabbing bite with the upper canines. It should be noted that the placement of these genera within the Oxyaenidae is still a subject of debate; some authors place them within the Hyaenodontidae or Limnocyonidae. Based on their cat-like morphology, we can assume that oxyaenids were mostly solitary predators that did not require the assistance of a pack to bring down relatively large prey items. Although they lacked the ability to retract their claws like nimravids and felids, their broad forepaws were clearly capable of grasping and could have easily have been involved in the seizing of prey in the initial stages of the kill. Other predators like mustelids, ursids, and dasyurids* do this as well. Their powerful skulls, meanwhile, could then deliver precise and devastating bites to captured prey. The most likely killing method would have been a piercing bite to the head or neck. In addition to sectorial* dentition, some oxyaenids also possessed blunt, heavy premolars similar to those of modern bone-cracking hyenas. Many oxyaenids were most likely hypercarnivores which fed almost exclusively on animal matter. However, at least some, like the genus Palaeonictis, seem to have been more mesocarnivorous: having a diet mostly comprised of animal matter with small doses of plant matter. Head sketches of three Oxyaenids from the early, middle, and late Eocene respectively. From left-to-right: Oxyaena lupina, Patriofelis ferox, and Sarkastodon mongoliensis. The genus Tytthaena contains a single species T. parrisi, the earliest and smallest known oxyaenid. This species from the middle Paleocene of Wyoming was about the size of a modern domestic cat and was similar in morphology to later oxyaenids such as Oxyaena and Dipsalodon. This animal’s genus name is a combination of the Greek words oxys and hyaena, literally translating to “Sharp Hyena”. Oxyaena lived from the late Paleocene to early Eocene of North America with most of its fossils being known from the state of Colorado. The last upper premolar and the second lower molar formed the carnassials. 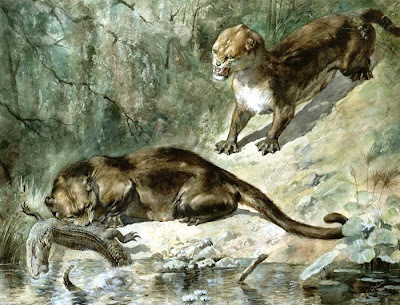 In contrast to others of its family, O. lupina was a nimble and lightly-built predator that may have been able to hunt both on the ground and in the trees. It had a dental formula of I3/3, C1/1, P4/4, M2/2 x 2 = 40 teeth. The genus name is derived from the Greek words palaio, meaning “old” or “ancient”, and ictis or ictidis, a type of weasel. Palaeonictis lived from the Paleocene to the early Eocene and are known to have inhabited North America and Europe. The genus is characterized by their relatively blunt premolars that were apparently adapted for crushing bones. Four species have been described ranging in size from that of a Wolverine to a Black Bear; P. pelora, P. occidentalis, and P. wingi from North America, and P. gigantea from Europe. The genus name translates literally to “Father Cat”, derived from the Latin words patrius, “father”, and feles, “cat”. Compared to Oxyaena the legs are stockier and the lumbar vertebrae are much larger and more robust. The caudal (tail) vertebrae are also larger and bear pronounced chevrons on their ventral surfaces. This suggests that Patriofelis was adapted to grapple with large prey animals by using its tail prop itself up while it stood up on its hind legs. The dental formula was I2/2, C1/1, P3/3, M1/2 x 2 = 30 teeth. Two species have been described based on body size, possibly representing different sexes of the same animal. P. ferox is the larger of the two, the size of a large Jaguar or a female Lion. P. ulta is smaller, at about one-third the size and may simply represent the female morph of P. ferox rather than its own species. The name Sarkastodon is derived from the Greek words sarx, “flesh”, and odous, “tooth”, translating to “Flesh-tearing Tooth”. The last and largest of the oxyaenids Sarkastodon mongoliensis lived during the middle to late Eocene of Asia. This animal is known only from a single skull with a dental formula of I2/1, C1/1, P3/3, M1/2 x 2 = 22 teeth. However, if its body proportions are similar to its close relative Patriofelis, Sarkastodon would have been an exceptionally heavily-built, powerful predator comparable to the largest felids such Smilodon populator and Xenosmilus hodsonae. Among contemporary predators, only Andrewsarchus mongoliensis was larger. Carnivora: the mammalian order which contains dogs, cats, bears, hyenas, etc. Dasyurid: any member of a family of small, predatory marsupials native to Australia. Digitigrade: a type of locomotion in which only the toes touch the ground. Metapodial: the bones which comprise the palms of our hands and the soles of our feet. Plantigrade: a type of locomotion in which the whole foot is planted on the ground. Sagittal crest: the ridge of bone that runs down the midline of the skull in many mammals. Zygomatic arch: commonly known as the “cheek bones”. Oxyaenids may be basal carnivorans. Hyaenodonts are probably afrotheres.